Home » Tips Episodes » How do Handmade Bags with Quilting Cotton Hold Up? I’m teaching another bag-making class this Saturday and became very aware that recently my purse of choice the last few years is looking a little worse for wear. I’m teaching the Candice Bag, and it’s been my favorite purse pattern ever because it’s got plenty of room and fits a variety of speciality purse items (tablet, random hand sewing project, etc.) without a problem. I needed to refresh my experience in making the bag so I’ve got it top of mind for my students, so took the time to make a new version for myself. 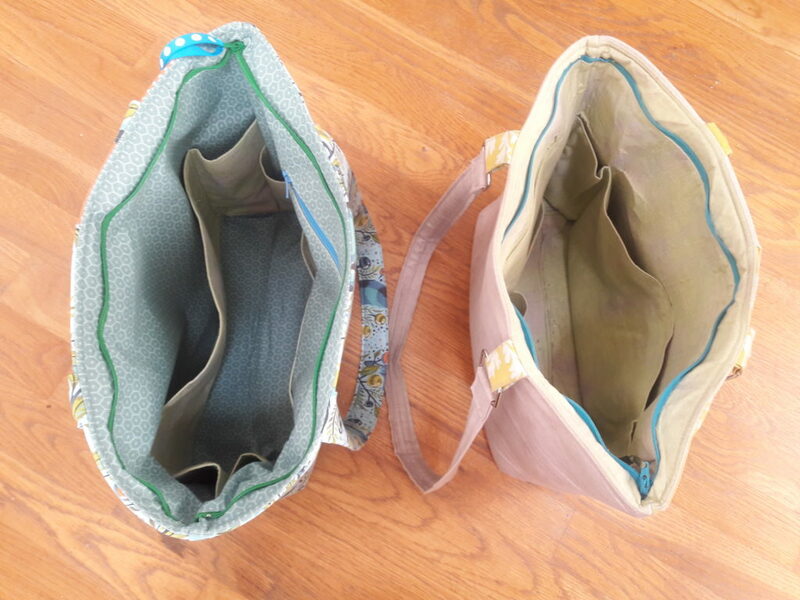 Here’s the side by side comparison of how the the handmade bag held up, from fabric to interfacing wear. On the right is the version I made of the Candice Bag in July 2015, about 21 months ago. I used a 10″ quilt block for the pocket panel, but it didn’t materially impact the construction of the bag or how it wore over time. On the left is the version I finished this week, with Tula Pink Acacia fabric. Both versions use Soft n’ Stable for the main body structure, which is a 1/8″ foam interfacing. I also used Pellon Decor Bond for the lining, which is a heavyweight interfacing. The original pattern calls for fusible fleece and a medium weight interfacing in lieu of the Soft n Stable and heavyweight interfacing; I like my bags to have structure! If you scrutinize the picture above, you’ll see the 2015 version has settled into middle age – it sighs and sags a bit when you set it down. 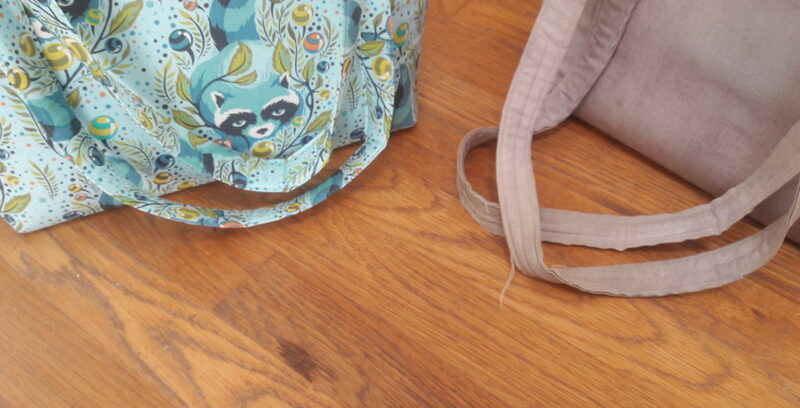 Typically in my bags, I use Decor Bond as the primary interfacing. For a reason I can’t remember or explain, I used a medium-weight only in the 2015 bag. The handles were always a bit squishier than I would have liked, and there is definite signs of wear and raveling on the very center of the handles, where I grab them daily and hoist onto my shoulder. The pattern actually calls for a combination of fusible batting and medium weight interfacing for the handles , which I stuck to for the 2017 version (subbing in Soft n Stable and Decor Bond). There is similar wear on the exterior corners, where the cotton fabric I used had holes rubbed in it. There is some bubbling or delamination in the 2015 version on the interior where the fusible gave up trying to hold on to the lining fabric; whether that is a result of simple wear over time or my own poor fusing practices, I’m not sure. Leave a comment if you have any insight! Note: it’s not surprising that my 2015 has way more crumbs and schmutz in the bottom of it than the new one. Decent structural integrity for the Soft n Stable; it probably would hold up for another year at least. Thanks for the side by side, I’d say your bag has held up pretty well for nearly 2 years of dailyish use! Of my 2 handmade bags, my Supertote is too floppy for my liking (only medium weight interfacing on outers) and my QAYG bag from Tara Rebman Craftsy class has great structure but I want to make one deeper with longer handles and in fabric I like. On the plus side my cat thinks they both make great beds! Would love to try another handmade bag now that I know what I like.